Making your own linking connectors out of wire creates unique chains! 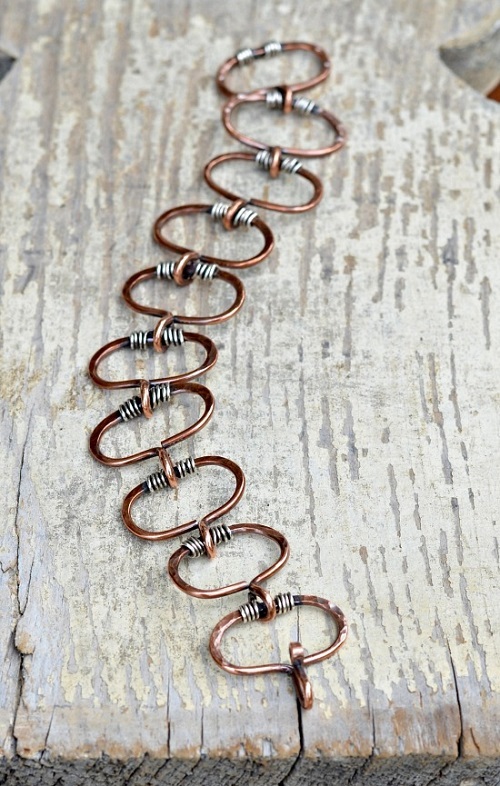 Just check out this lovely free copper chain bracelet tutorial by Cindy Wimmer over on Craftsy. Her idea of using 2 pen barrels to form the oval is brilliant! Alternatively, I wonder if making a round shape first using an appropriate sized round mandrel (find one around the house) and then squashing it down will work? Must try this myself. In order to get consistent loops, either mark your round nose pliers (see this post on how to do so easily and quickly with metal gauges) or use round bail forming pliers like this one . Bail forming pliers come in several sizes. I've found the large and then the medium ones to be the most useful. The designer used some contrast silver wire to decorate the chain bracelet. Consider wiring in some beads to fill the interior space of each component. I like the look of this chain as it's different from what you normally see. I would have to cover up the end of that one wire. Even though it's flush cut and just like a jump ring it would drive me nuts...like something unfinished. I'm thinking wire wrapping around it would be my way to go.